I keep losing my star of David pendants. Maybe I should try shirts instead. 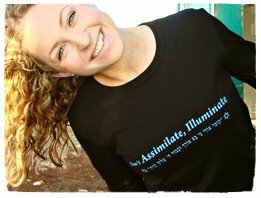 Check out the “Don’t Assimilate, Illuminate” t-shirt at HebrewTshirts.co.il. As the URL hints, most of the taglines on the t-shirts are in Hebrew but I’ve been meaning to practice my Hebrew reading skills anyway.